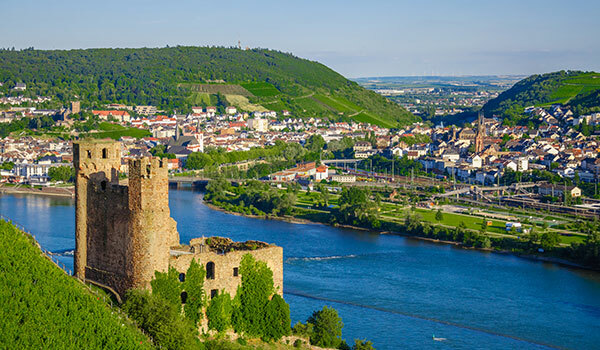 Situated on the banks of the Rhine River, just outside of Frankfurt, Rüdesheim am Rhein is a charming city filled with romantic castles, world-class wineries, interesting museums, and beautiful landscapes. Visit local landmarks like the Niederwald Monument and the Saint Hildegard Abbey. Wander through picturesque vineyards and taste the bounty of the Rhine River Valley. Enjoy unique events like the Rheingau Musik Festival and the Musica Mechanica Fair. Or, see local vineyards and castles on a romantic Rhine River cruise, carriage ride or excursion on the Winegrower's Express railway. For fabulous day trips from Frankfurt, Rüdesheim am Rhein is the perfect destination. How do I get to Rüdesheim from Frankfurt? Less than an hour from Frankfurt, you can easily reach Rüdesheim by car or train. By car, take the A66 via Wiesbaden, then take the B42 along the Rhine to Rüdesheim am Rhein. To reach the city by train, hop aboard the Rheingau line running between the Frankfurt Main and the Koblenz main stations. Check the traintimetable for departure times. Are There any spas in Rüdesheim? The Frankfurt Rhine-Main Region is famous for its mineral springs, bathhouses and spa facilities. Rüdesheim is home to three different day spas and wellness hotels offering everything from warm steam baths and soothing mineral pools to relaxing massage and indulgent body treatments. Visit the tourism website for spa listings and services. Why Stay at Holiday Inn Frankfurt Airport?